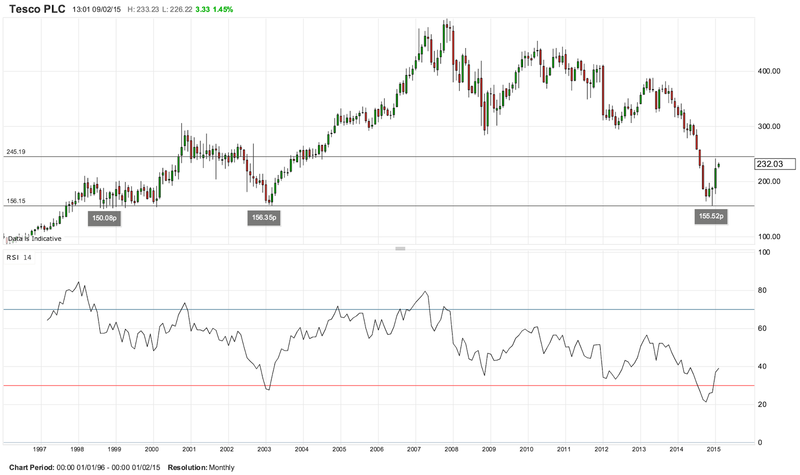 Market View by David Atherton: Tesco stalling? Anyone who follows my Twitter account will know that I regarded Tesco (LON:TSCO) as a buy after it touched the (very) long term support of 156p, which it did on December 9th. Since then it has recovered nicely after management reorganisation touching a high of 241.88p on January 23rd, a 55% increase! However in the last seven days, the rise has stalled, and there are several technical reasons for this. Consider this daily chart. The first and obvious point to note is that the price has hit the 200 day simple moving average, which is always major resistance. Unusually the 20 day moving average is supporting it. 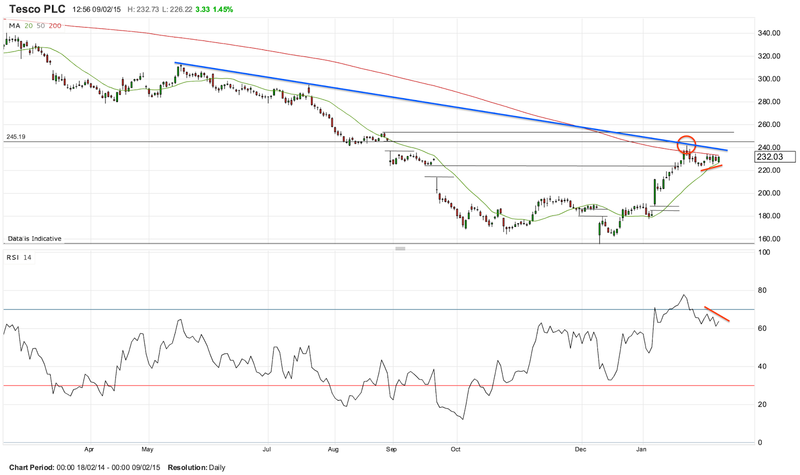 Secondly over the last few days, there has been sharp bearish RSI divergence, that is the RSI is showing lower highs and lows, whereas the share price is showing higher lows. Note also that the rising price has easily filled three gaps from last year, but it is not managing to fill this gap to 245.19p, with a shooting star failed attempt on January 23rd. This failure could of course be put down to the fact that it was overbought on that day, but subsequent failure over the following two weeks suggests that the SMA200 is weighing hard on any further upside. Note also the blue trendline which touches three times. Whereas the stock is still a long-term buy, it is distinctly possible that the SMA200 and trendline will gently push the stock down until some event occurs. Unfortunately most of the macro events at the moment are not positive, and the next Tesco earnings release is not until April 22nd. My advice, hold, but consider hedging with a short. Do not open new buy positions. PS I'm sorry for the long delay in posting here. Since my last blog post, I have tweeted market views over 1,000 times.